This happened twice to me recently, both with Better Call Saul and Silicon Valley, and it elated me each time. For both shows, I watched what I thought was the final episode of the current season. My mindset throughout the entire episode was that I was watching the finale, and the ending of each was conclusive enough (but with a bit of a cliffhanger) to confirm that assumption. But I was wrong for both of them. The next week when I turned on my TiVo, there was another episode of each show. I checked the description for each one, which informed me that I was about to watch the real season finale. This is simply the best. If you’ve never had it happen, think of your favorite TV show. Imagine you’ve just watched what you thought was the final episode of the season. There’s no doubt in your mind that you have to wait another 9-12 months before watching another new episode. Then, a mere week later, you already have a new show! How awesome is that?! I look forward to this happening again in the future. This entry was posted on Sunday, July 2nd, 2017 at 9:12 pm	and is filed under pet please, television and tagged with pet please, television. You can follow any responses to this entry through the RSS 2.0 feed. Happy 4th of July to you, Jamey! Charles: I can see how knowing the episode count up front would prevent this type of pet please from happening. For some reason, this season felt long to me (in a good way). I’m genuinely surprised to hear that it was a shorter season than the others, as every week I was delighted that we weren’t at the end yet. Just to clarify, it was not a longer season than the previous Better Call Saul seasons (they have all been 10 episodes). 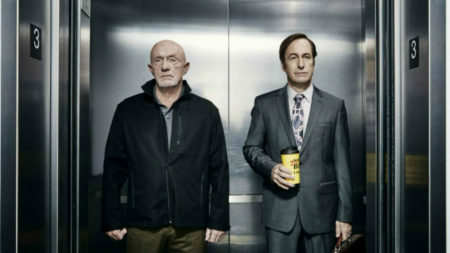 The Better Call Saul seasons are just shorter then the majority of Breaking Bad seasons. Hence the feeling of not getting enough! I think this last season made great strides in the dramatic narrative of the show (more so than the first 2 season in my opinion) so maybe that’s the reason why it felt long to you? Ah yes yes, thanks for clarifying. I agree that the dramatic narrative may have played a role in it.